Earphones There is 1 product. Federal 40 are stylish, durable earphones. 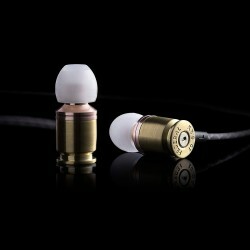 The brass construction ensures high durability and at the same time gives the earphones a unique, elegant look. Processing of the housing (cartridge shells .40 S&W) and embedding the speaker and cable is hand-made.